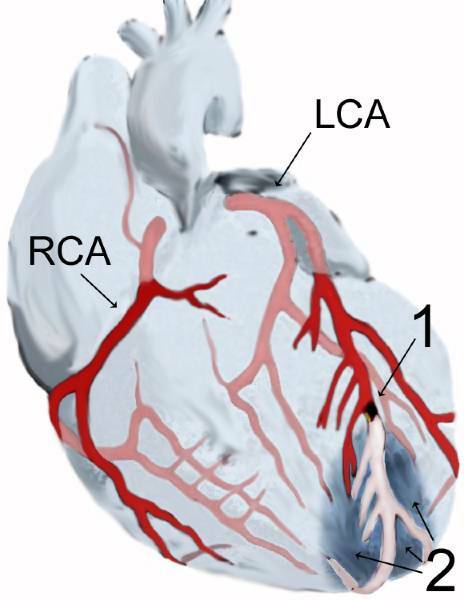 Anterior wall myocardial infarction at the apex of the heart (2) after occlusion (1) of the left anterior descending artery (LAD), a branch of the left coronary artery (LCA). Schematic representation. Myocardial infarction is a regional loss of myocardial tissue secondary to impaired circulation. It is caused by occlusion of the lumen of a coronary vessel. About 20% of infarctions are asymptomatic ("silent" infarction). The severity and quality of the symptoms differ widely between individuals.